Sometimes it’s the books that you least expect to grab you…that actually do. I knew nothing about this book when I picked it up, and what I found was quite a treat. It immediately reminded me of another favourite of mine You Must Be Joking! By Mike Dumbleton. Jack’s sister Lily is starting school, so he is left with only his dog Hector for company. What starts off as a quite day with Jack standing guard at home, turns into an action packed race to retrieve Lily’s telescope, snatched away by the Outlaw. Jack jumps on his trusty stead and gallops after the Outlaw. He battles snakes and bunyips, ploughs through a scorching desert, crashes through a rainforest until he comes face to face with the thief and battles it out until the telescope is once again in his grasp. 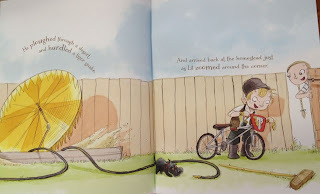 The real treat for me was at the end of the book, when Jack has returned from his gruelling exploits, we see him...in the backyard…on his bike. There are upturned pot plants (rainforest), a paddling pool (billabong) a sandpit and umbrella (dessert and scorching sun), a hose (the snake), and the evil outlaw perched on the fence. 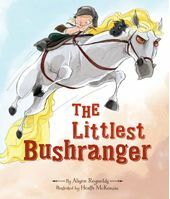 Boys will love this rollicking read, which shows that all you need to have an adventure is a good imagination. It doesn’t hurt that it’s also a bargain at $14.95 for a hardback!